Hello. I am "new" to this. I have had my Model T's for about 5+ years (in storage) and am wanting to get them going. 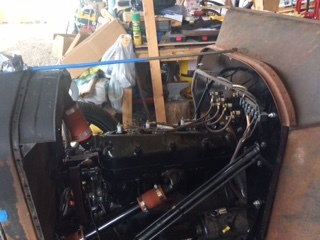 I am working on the 1919 Roadster. 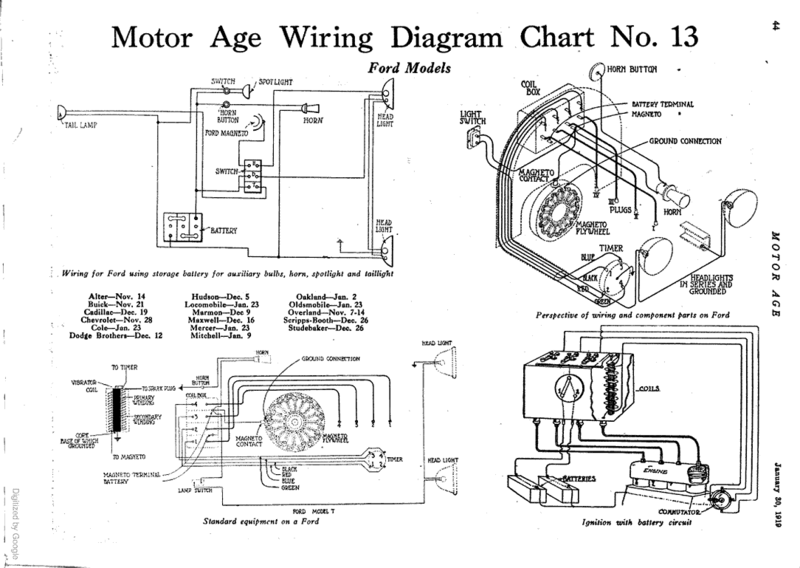 All wiring is hooked up correctly per schematic from Langs. However there is no coil buzz at all from any of them. Two coils are "new" 5 years or so ago. Oh by the way not to sound dumb but I am not a car mechanic...so well explained lemans terms please. ANY help would be grateful. Thanks so much. I am learning as I go and hopefully alot. Turn the key to “Bat” and measure the voltage between the contact on the bottom of your coil box and ground. Zero volts is likely a switch contact issue, some number over zero but under six is a weak battery. At least that’s where I’d start. Batteries are easy to replace and switches are nearly as easy to fix. Is your ignition switch in "Bat" if it is in "Mag" they wont buzz. If your ignition switch is in "bat" and you rotate the engine does any coil start to buzz? Is your battery fully charged? Oh, and welcome to the hobby. Don’t worry about not being a mechanic, these cars were designed long before any modern mechanical conventions were in place. It’s more important to be careful and methodical when working on a T, if you get stuck there is plenty of help available here. Oliver, I am assuming you are using a 6V battery that's CHARGED and known good? Make sure your switch is turned to battery. If you're still not getting a buzz, the next easiest thing would probably be to bypass the switch and power your coils directly from the battery. 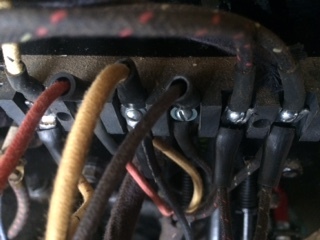 Remove your battery wire (terminal position 1, lower wire that goes directly to the starter switch terminal) and put it on your coil box terminal. DO NOT TOUCH IT TO THE MAG WIRES, you can discharge the magnets! Now check again for buzz. If still none, there's a couple things left. 1. Your coil box itself had something wrong with it. You will simply need to rebuild it. Very easy to do. 2. Something is up with your timer. Possibly the spring (if it's a standard roller type) broke so it never makes contacts. Of course, if you've got a source of better or known good coils, that's always good, but usually 1 out of 4 at least works. I believe I've covered most all of the possibilities? Others please add on or correct me. One more question are the coils firmly seated in the coil box, and does the box have a lid? Did you turn the key to Batt and then turn the crank? If the engine stopped with the timer between contacts it will not buzz until turned to a position that makes contact. Just to be clear, They won't buzz at all, no matter what position the crankshaft is in? Or you are just turning the switch on and don't get a buzz? You only get a buzz when the timer is making contact. There's roughly half the area inside the timer that makes contact. The other half not. 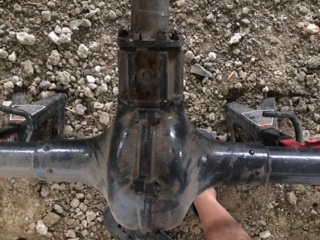 Try moving the crank shaft to another positon and see if you get a buzz, or maybe advance the spark lever with the switch on battery and see if you get a buzz. You are on battery and not magneto, right? You won't get a buzz on magneto either. Yes. They are firmly seated and there is a lid. No buzz no matter the position on the crank. I think I tried all positions on the switch but will try again on batt to double check. Thank you all so much. I will let you know what I find out from this. Hopefully it is the simple switch not on battery trick. 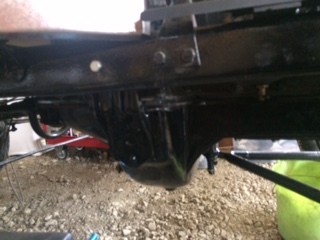 If I can I will post some pictures of the one I am working on. As a diagnostic test, you can disconnect the red wire running to the magneto terminal, then run a 6V jumper wire directly to the battery terminal of the coil box. That will take the switch and other wiring out of the picture. Disconnecting the wire from the magneto terminal will help ensure that you don't accidently apply 6V to the magneto coil, which can harm the charge on your magneto magnets. Check your battery's ground and positive connections. Too many times I chase electrical problems only to find I did't have a tight connection to the battery post or the ground is not making a solid clean contact to the chassis. 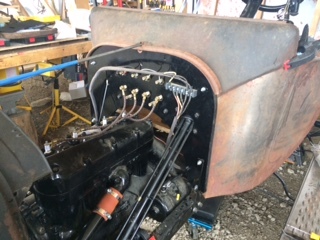 Looks pretty much like a regular Model T. Did you get it running? Do your headlights burn? If they burn your getting current from the battery. If not check your battery connections closely. Check the switch and connections. Then check the timer and coil box. 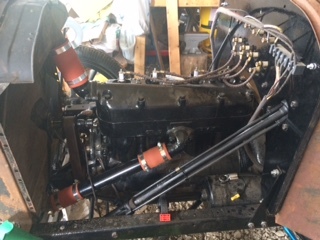 Does the 1919 roadster have a starter? If it does the starter button is on the floor just under the steering wheel. You didn't mention about trying to start it. Pull the hand brake back and push the starter button. If the engine turns over the battery is good. The engine will turn over whether you have the ignition switch on or not. And if it does turn over the problem is in the switch, timer or coil box. Thank you John and everyone. Still not starting but going through everything that has been mentioned here slowly. I still work and a Mom in nursing home and no lights in my barn, so it takes me awhile to do. Hard to tell clearly in the pictures but I don’t see any wiring going to the battery or magneto terminal on your coil box. Since you are using the electric car ignition switch there should be one wire running to the bottom right terminal (drivers side) that provides either battery or magneto power from your switch. Yes there is one to that one but not to the bottom left one. Should there be to the left one also? No just the one. There are two terminals on the box which you would use if your ignition switch was mounted on the box for a non electric car. Your pictures must be from before you wired in the dash harness. Yes I was thinking afterwards but it must have been before because I do not see them coming through the firewall and going to the buss bar. 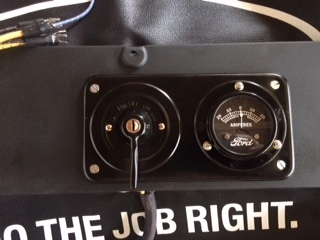 Does your coil box have a switch mounted on it? The earlier question on if it turns over? Yes it does with the starter switch. But does not start. Just rolls over like it would want to. Oliver - some simple advice. Until you find out the problem, disconnect the wire that connects to the magneto pick up on top of the hogs head. IF- DC voltage accidently finds it's way into the magneto while you are troubleshooting and checking connections, the magnets will be disabled. As I look at the pictures you posted of your engine I noticed that the timer rod crosses over the water pipe. It should run UNDER the water pipe. Thank you John and Bill. I will disconnect that wire for now. Also I did not know that the rod should be under the pipe. Good to know, I will reroute under and see if the timer is more in the appropriate position. Glad I posted the pics. Wish you were closer-would be happy to help you figure it out. Any club or Model T guy you can get together with? Most are happy if not eager to help. I wish too. The only one that I know of (with great respect to him) is in his late 90's and in very poor health. So he can not get out and around he seems to forget a lot too. But methodically through the forum maybe it can be resolved. I do appreciate everyone's help so much, as I am less then novice. 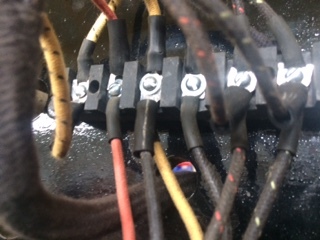 Take the coils out and check that there is a connection between both battery and mag terminals that stick thru the fire wall and the strip located in the bottom of the coil box. OK. I shall do that tonight Mark. Thank you. I think I understand, use a volt meter correct or just visually? The wires that connect the terminals to the strip are under the wood bottom, so check with meter. The strip at the bottom is the power connection, battery or magneto depending on which way you turn the key. Set your meter to 10, 20 or 50 volts DC and see if you are getting power with the key turned to battery. You should be getting battery voltage. If you are getting a reading ok, if not, before you pull the box to check move the key back and forth while checking. If you get a reading doing that the switch might need attention. Will do, thanks again. It is a brand new switch so I would doubt the switch but then stranger things have happened. I can't tell too well but it appears you only have a single YELLOW/BLACK wire connected to the leftmost terminal (#1) of the barrier strip up on the firewall. There should be 2 YELLOW/BLACK tracer wires there. Likewise there should be 2 SOLID YELLOW wirs on terminal #3 (third from left). I only see one. 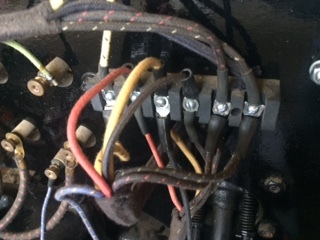 With nothing else connected to terminal 3 but a single solid yellow wire then you have nothing connecting power from the battery Positive terminal to the ignition switch which would make your car spin over but no sparks, no lights and no ignition or charging when the car would start. You need to get an accurate wiring diagram and trace each wire since you have some wires totally missing but a closeup view of the barrier strip would help me (6 terminal strip in the upper corner of the firewall on the driver's side). Thanks John. The pictures were before I had the dash wired. 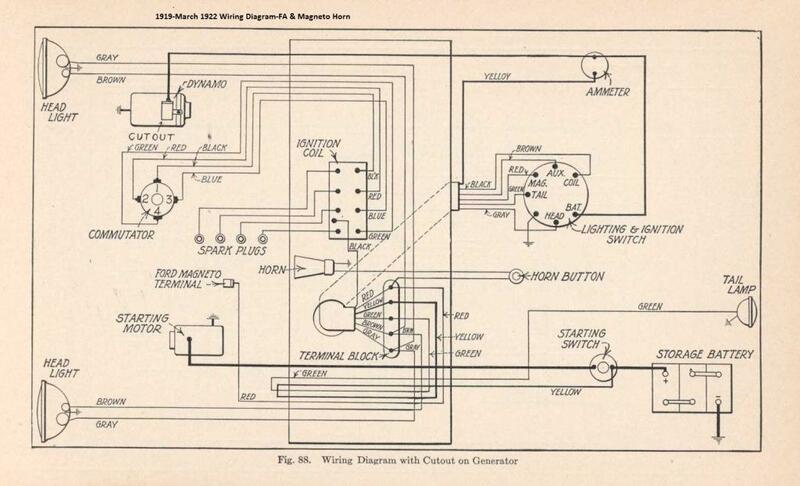 The wiring diagram I used is Lang's and the one provided above. With key and amp meter "dash" wired in I have all the wires hooked according to Lang's diagram. I will get a close up of the terminal strip though, because you may see something that I did wrong. Unhooked wire at hogsheads. Put timer rod under water pipe. Went to take the four coils out of box, they would not slide up out. Took box apart. The wire off of the bottom that comes up to meet the brass/copper dot, should that go to the bottom right post(drivers side) where the blue and yellow striped wire connects or should it go to the button on the left side post (passenger side)? It was on the passenger side but not attached to the button (I don't believe) but there is nothing that attaches to that post when it comes through the fire wall - unless (as I understand it) it would be without a starter which I have. Also a lot of the copper/brass is green - should I lightly sandpaper it with say 220 grit. Thanks again. I have not put box back together yet. Light sand with 220 grit might work wonders in this case. Thanks Kep. Do you know the answer to the rest of the question with the box? As you are using a switch on the dash, in this case, does not matter. 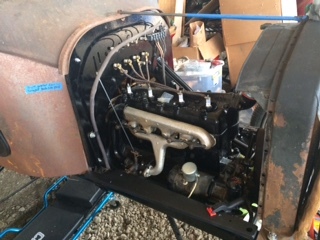 Normally the coil boxes used on cars that had the switch on the dash only used the drivers side connection/terminal and would not have had the other terminal. Switching between mag-off-batt is done at the ignition switch. Cool thanks. Does that little wire actually have to be connected to the button? If so should it be soldered? What button are you talking about, can you post a picture? Which side of your starter pedal (foot operated button) do you have the yellow wire connected to? It needs to be on the side the wire from battery is connected to. 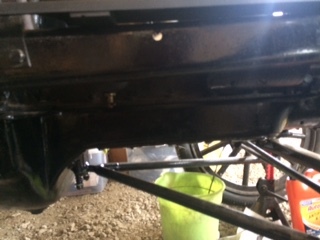 Another thing with your timing, the distance between the timing rod connection on the timer and the bolt that holds the timing cover spring center to center is 2 1/2 inches when the spark lever is fully retarded. Did not know that about the distance. I will take a picture and also check the yellow wire connection this evening when I get there. The button is the one you see in your last picture that is on the upright wall on bottom left (in the picture) with the black coated wire coming up to it. I also see that you have some thing soldered to the button on the floor of the box, where does that go? Or is that part of the same wire going the button on the wall? (Sorry I hope I am not to confusing). 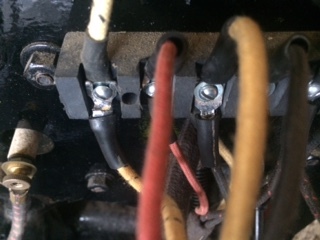 Terminal block wiring is generally correct, except that black horn wire for the electric horn switch should go to the generator/ammeter yellow-black terminal. Horn will sound better from the generator than the storage battery when car is running. Re the coil box connections. Yes the black wire goes from the contact strip to the terminal(button) that sticks thru the firewall and is soldered in place both locations. Thank you George. Good stuff. Printed off for double checking. Are you having any luck Oliver? Just got the box for the coils back together tonight and ran out of time day light. Hopefully Monday evening I will be able to check for buzz and with great hope possibly a start up. Thanks for asking. I still have to check the timer and spring, but the wire in the box did not seem attached when I took the coils out, but I have it soldered up now. So wish me well. I'm so anxious to start her up and try her. I have named her Lavinia.